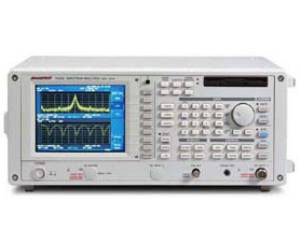 Built around a newly developed direct digital synthesizer, the R3132/3132N/3162 spectrum analyzers offer a frequency span accuracy of 1% or less in frequency ranges of 9 kHz to 3 GHz (R3132/3132N), and 9 kHz to 8 GHz (R3162). The built-in auto-calibration feature assures an over-all level accuracy of 1.5 dB. Dramatically enhanced distortion characteristics of a 1 dB gain compression point of 0 dBm input, a second-order harmonic distortion of -80 dBc, and a two-signal third-order intermodulation distortion of -80 dBc make measurement in a 117 dB broad dynamic range possible. The new synthesized local oscillator enables the R3132/3132N/3162 to speed up sweep time, updating as many as 20 traces per second. This capability makes for more real-time waveform observation. The R3132/ 3132N/3162 personal spectrum analyzers are designed to fit into a broader range of applications than before.